Finally! The sun has returned! And with it comes the season of sharing picnic tables with drunk strangers on Portland's glorious patios. This summer we're all about VIBES, so here are some patio options for whatever day-drinking, sun-soaking mood you're in. The historic Washington High School is a gem to explore. The recently remodeled campus is surrounded by a sprawling dog park and ground-level patio, and inside are hallways filled with lockers, indoor bars, and an 850-seat venue. But the real money is the rooftop bar with an incredible west-facing view of downtown. Lined with picnic tables and boasting a full bar (no running stairs for drinks! ), you’ll only get a few reliably non-rainy months to check out this stunning view with a cocktail in your hand. Watch the sunset over the city and keep drinking until the starry lights come on above you. 1300 SE Stark, Mon-Fri 4 pm-late; Sat-Sun 1 pm-late. Opened in 2006, Vendetta existed on Williams long before it was the street we know today. 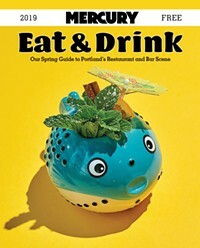 The Mercury’s original review called the bar “hassle-free,” and “friendlier than it sounds,” which are both still true of the now-staple of North Portland. The unpretentious gravel patio is lined with planter boxes and vegetation, where one can easily find a private nook or cranny to slip into for a cheap beer or delicious cocktail. 4306 N Williams, 1 pm-2 am.